There are four common species of animals who die soon after giving birth. These are the octopus, the squid, salmon and the common mayfly. For the most part, the males die soon after fertilizing the female's eggs and the females live only long enough to birth their young before dying. Octopuses are one of several species that die after they mate or give birth. A male octopus will either fertilize a female's eggs himself, or he will give the female his sperm to keep until her eggs are ready to be fertilized. Soon after this is complete, the male octopus will die. The female lives long enough to give birth to her young, then dies shortly after her young octopuses are born. 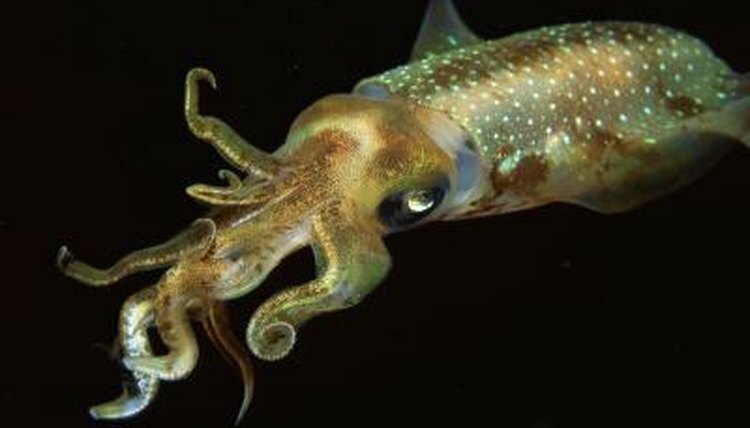 Much like their similar counterpart the octopus, squid do not live long after giving birth. The process is identical to that of the octopus. The male dies shortly after mating, while the female lives long enough to see her eggs hatched and alive. Depending on the species, it can take as little as 30 days and as long as a year for this to take place. Once the eggs are hatched, the female dies. Salmon are by far the most interesting creature that dies after their birthing process, also referred to as spawning, is complete. Every year, salmon return to the spot where they are born to lay and to fertilize their own eggs. After making a journey of as many as 2,000 miles, the male salmon may spawn with several females if they are strong but females usually just spawn with one male. After spawning the salmon die. The females may live to guard their nests for a week or two after spawning, but many are too exhausted after their long treacherous journey home to do so. When they die they are washed downstream and end up on the river banks as food for predators. Mayflies are unique to the group of animals who die after the fertilization and birthing process is concluded because they have the shortest life expectancy. Mayflies live as little as a day, two days at the longest. During this time, the male finds a female and dies soon after mating. The female dies soon after spawning. Georgia Basin/Puget Sound Research Center; Observations on mating of giant Pacific octopuses; Anderson, R.C. Squid as experimental animals; Squid mating behavior; Arnold, JOHN M.
Animal behaviour; The mating biology of a mass-swarming mayfly. Allan, J. D., & Flecker, A. S.